Photo: Australian Electoral Commission website. Australian Prime Minister Scott Morrison has called the Federal Election for Saturday 18 May 2019. Voters only have seven days to enrol, or check their details are up-to-date, once the election is called. 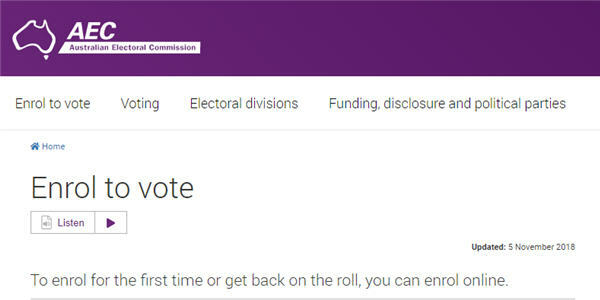 If you are eligible to vote now is a good time to check your enrolment details are up-to-date. Voting is compulsory for all Australian citizens aged 18 and over. New Zealanders who were on the electoral roll immediately before 26 January 1984 may also be eligible to vote in Australian elections. If you are unsure whether you were enrolled on this date contact the AEC for assistance. Kiwis who can vote should do so. Not only is voting compulsory, but many New Zealanders are denied voting rights in Australia. Oz Kiwi acknowledges that not all Kiwis can vote, or gain permanent residency. We will continue to advocate for a fair pathway to citizenship for all New Zealanders in Australia.